I first heard of Lulu from my comrade Jan Claire. Jan and I became friends over the internet few years ago when I was working with Golden Corral in an effort with the Veteran’s Day. He has a website called www.merhaba-usmilitary.com with pictures and memorabilia from American veterans who had once served in Turkey. I loved his website full of good thoughts and memories of soldiers of my age, talking about my home country. And of course a big fan of Turkey Jan loved my web site www.istanbullite.com and we both gave cross links to our respective sites. We occasionally write to each other on our mutual subject :Turkey and I follow him from facebook .I don't have a facebook page, but Jan and my wife are “friends”. During my upcoming Istanbul trip in November I was planning to make several exploration stops in the Pera district including some cemeteries. I wrote to Jan that since I will be in the neighborhood, I will try to look for his long lost friend Lütfiye Duran, aka “Lulu” ’s grave. He seemed to be delighted. Following is all I know about Lulu from Jan’s 6 or 7 e-mails addressed to me, all in his own words; slightly edited, cut, copied, pasted and arranged into a story form. I knew Lütfiye Duran in 1959-1961, then lost touch with her since I had neglected to get her postal mailing address.She was an English professor at the University of Istanbul and did some translation of Broadway musicals into Turkish. They were building the new Opera House in Taksim Square when I left istanbul in 1961. Lulu’s father was Faik Sabri Duran who had died long before I met her. He was a well known author and a map specialist who had created the Büyük Atlas, the Geography Book of Maps used by students for decades in the Turkish middle and High schools. Lulu’s mother was of British origin and all I knew her was by “Mummy”. She only used this familiar name when referring to her. Lulu and her mother lived in separate homes about two blocks apart on the South side of Siraselviler Caddesi, a few blocks from Taksim Square. I remember a hotel next door to her facing the street, I think it was “Park” or “Parc Hotel”. I will say this , Mummy was one of the funniest British women I have ever known. Think of actress Judi Dench at her funniest comic acting best!. I remember; a friend and I pulled up to Lulu's home on Sıraselviler and we paid the driver by American standards only a few kuruş, but Mummy rushed down off Lulu's porch and accosted the driver speaking Turkish so fast, we could only make out a couple of words. She was furious with that poor driver and she was still shouting at him as we decided to get out of there and go up and sit with Lulu. After the debacle, and the driver eager to depart as fast as possible, Mummy returned to the porch and handed us our money back. I never knew if that was her plan, or if she was really upset about it. But I do think he gave her the money merely so he could depart. Her little one bedroom house was on Sıraselviler, 3 or 4 blocks off Taksim Square and I remember her garden had a high, perhaps two story brick wall along one side and from the other side of which we always heard music at night, the equivalent of today's "discos". I also remember that Lulu was a friend of a singer named Zeki Müren, and we were invited to a couple of parties at her house and garden that he (she?) attended. We liked his music, but found him a little strange...he always arrived with bodyguards. What I loved about Istanbul then was the remarkable mix of people, many of whom , one would think, would not be friendly with each other, but somehow make it work. In my friend Lulu’s neighborhood there were Greeks, Armenians, White Russians, and even a few Americans and they all got along just fine. Gosh...that just brought back the memory of sitting on the expansive lawn of a large Victorian mansion in Üsküdar, having a lunch beneath trees provided by a door-to-door fresh crab vendor while visiting a White Russian family, friends of Lütfiye's late father, Faik Sabri Duran who mapped the Aegean coast and created the Büyük Atlas. 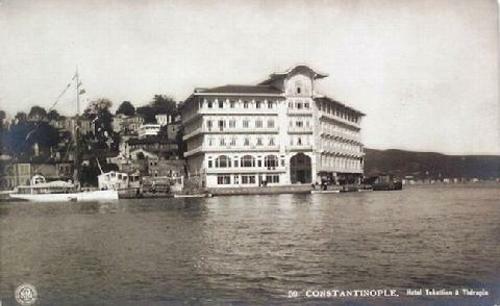 I wouldn't rest until I had explored both sides of the Bosporus up to the Black Sea and met as many people as I could. This was back when I had studied Turkish and spoke enough to at least combine with what English the people I met happened to know. Somehow I found my way around and Lulu was a big help in a lot of those explorations. Even at the ripe age of 18 I arrived in Turkey, I found it easy to overlook the newer, and was fascinated far more with the ancient. I'm as alive with Turkey in my head today as I was 50 years ago! 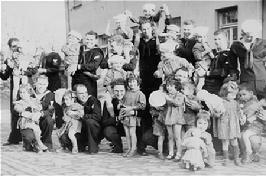 A good friend of mine Jim Klipa was one of the many sailors who helped raise money to support the Kocamustafapaşa Orphanage in the Bomonti sector of Istanbul. It was run by the Catholic Little Sisters of the Poor who do needed work around the world, and so at our base radio station we had a fundraiser. Jim contributed to it financially, but also helped organize the presentation "ceremony" in Istanbul where we presented milk and blankets to not only the orphanage, but to a Little Sisters of the Poor-operated home for the elderly. As the picture at left shows, we arrived in force, and meeting the young people in the orphanage was thanks enough for us, but the scene was repeated at the old folks home, as well. 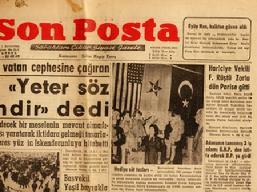 It was front-page news in Istanbul that American Navy and Air Force men and women had raised that much money. Then, not long afterward, the earthquake struck in Erzurum, I and the same group of guys traveled by every means possible to go back east to help move concrete, wood, and whatever we could do to help in the earthquake relief effort. Somewhere in there, was a Coup d'etat in Istanbul*, and several of us spent a night transporting people from the Istanbul side of the Bosphorus over to their homes in Üsküdar. Some of our guys actually rowed boats but we had an outboard motor on ours! these things we got involved in during our time in Turkey, and, oddly, every one of us continues to do that sort of thing here in the U.S. It's like Turkey taught us the value of helping others! I don’t know when Lulu died but I have always comforted myself that she had died from having too much fun in Istanbul.I have never seen her grave nor that of her father Faik Sabri Duran. I am fairly certain they might be buried close to each other, perhaps in a family plot, but I have no proof of that. A friend, James Candon, who is an international businessman and lawyer in Brussels, Belgium, attended a conference in Istanbul a couple years ago. He is the one who said that Lütfiye Duran's grave site was in the Feriköy Protestant Cemetery in the Feriköy neighborhood of the Şişli district, north of Taksim Square . Near there is the quarters of the "Little Sisters of the Poor" Catholic charity whom we supported while living in Turkey.When James Candon visited the charity one of the nuns there remembered us coming to offer blankets, food and support for their Orphanage they operate there. Cem, any information you can find, I would be most grateful! I think the hardest thing to come up with will be a picture of Lütfiye...she didn't drive, would not have had a license, and even when we were touring various places, she would "make herself scarce"when we started taking pictures. I think, for a time, I had a polaroid picture of her taken behind her while she was at the beach up in Kilyos at the Black Sea coast and she was wearing some sort of flowing beach robe. So all I remember of the picture, was that it looked like a piece of cloth blowing in the wind...but with hair at the top. And I lost it ! the only picture I had of her. On the other hand, I was able to find a lot more information about her father Faik Sabri Duran, the famous Geographer who lived both in Ottoman times and during the era of the new Turkish Republic. He has numerous books about geography, travel and including some very old ones in Arabic script in the library of Congress. His name is familiar to me and I remember using his most famous work the Büyük(Grand) Atlas when I was in middle school. Mr Faik Sabri Duran had died in 1943, I was not even born yet and I am guessing Jan Claire was only a toddler. We don’t know how old Lulu was when her father died but I found a book on the internet which gave me some clues about the years when Lulu was born. 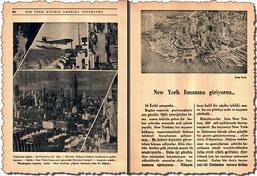 The book entitled Amerika Yolculuğu (Voyage to America),- A Turkish Girls travel to the United States- was written in Turkish by Faik Sabri Duran from her daughters travel notes. The travel took place in 1933 and the book was published in 1935. Unfortunately no copy is sold in the internet bookstores I have researched, however two copies are available in college libraries; one in Cambridge University and one in Bilkent University in Ankara. One can make the assumption that at the time of travel she had to be around twenty years of age since it would very uncommon for a younger girl to travel by herself so far away from home in 1933. So..., she was probably born in the early part of nineteen tens and was in her early or mid forties when Jan Claire met her in Istanbul in 1959. The only other information I found about her on the internet was that she had taught at the University of İstanbul and the former Girls School by Robert's College, she was involved in theater and cinema and translated some plays and drama books into Turkish. That is about it, we don’t even know when she had died. But that I will find out ! Lulu was a very personable lady in a sort of "motherly" way and she was older than us. She had blond hair with a bit of white in it, I think she was about 44 at the time, I have ve never known her age for certain. She was in good physical shape, and due to the era (1959-61) everything was geared to preserve modesty. Lulu was very much like Sitare in size and look except her hair was a little shorter and curlier. She was quite athletic and long days of walking, hiking, even running, were no problem for her.She spoke with a British accent, probably because her mother had lived near her and all their conversations were in English, and I remember she told me her dad was also English-fluent. But she could bounce from English to French to Turkish flawlessly and at conversation speed and she also spoke some German and Italian as well as Greek. A very brainy woman...and she knew everything about the places we visited in Turkey. We rambled as far as Cappadocia and were impressed by the Mevlana Sufis and their whirling dances in Konya . "Burasi, Istanbul radyosu ... ve şimdi sizin için sunmaktan büyük memnuniyet duyariz, müzik Tommy Edwards." or something to that effect. Those were the days! Finally a picture of Lulu with an article about her mother "Mummy"
It has been over ten days now, since I started researching and writing about Lulu. Before going to Istanbul I tried to make a last effort to find the exact location of her grave. No luck with Google, again I came up empty handed about the plot of her grave location in the Catholic Cemetery, but bingo...! I found an article written about her mother, dated August 3, 1986 in the Cumhuriyet Daily with some pictures. 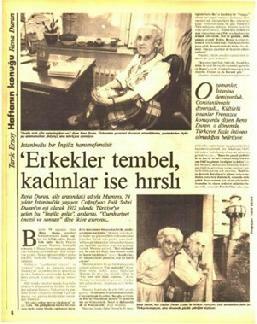 The article written by Tarik Ersoy titled : “ Men were lazy, women were ambitious” and subtitled:” An Istanbulite English Lady”, has a picture of Lulu and her mother Rena aka Mummy* in their balcony of their condominium in Siraselviler Caddesi with the minaret of a small mosque showing in the background. In the second picture Mummy is sitting at a desk apparently in her study with legs crossed and her hands together on her knees, wearing a plaid skirt, little flower pots showing in the window sill. She was ninety eight years of age when the pictures were taken and Lulu had to be close to seventy. The article is an interview with Rena Duran, an English woman who marries the famous Turkish Geographer Faik Sabri in London in 1912. The young man is studying in Sorbonne when they first met and until he proposes to her he disguises himself as a Frenchman. When the young English woman learns that her future husband is actually a Turk, she does not show any reaction but merely says “since you want to learn English and we both like to travel, Constantinople is fine with me.” So the groom to be, puts his fez on and they go to the Turkish Embassy in London for a civil ceremony. She tells that when they moved to Istanbul in 1912 the city was still referred as “Constantinople” and most everybody spoke French in the Pera district where they lived, so she never needed to learn Turkish. She still did not speak Turkish fluently like her daughter, although Lulu had some difficulty in reading Turkish. Why did Faik Sabri initially not tell Mummy that he was Turkish? My guess, the reason was religious as well as political. Before the war Ottomans were under the military influence of Germany and conflicted with the British in the Middle East and elsewhere and also Mr. Duran was of the Islamic faith. He must have felt uneasy telling her everything at once when they first met in Paris. As far as the photographs in the article, I wish the article included Lulu’s and her Mother’s pictures of earlier years. After all 26 years had past since the pictures were taken when Jan Claire had first met the mother and daughter. But these were the only pictures of them and I was happy. Rena who became a dual citizen and accepted Turkish citizenship when they moved to Istanbul speaks of the city in two distinct era : before and after the Turkish Republic. Before the Republic, during Ottoman times it was not easy without getting harassed to walk in other parts of Istanbul except Pera, with a short sleeve dress. Turkish women had come a long way since then and they don’t want to go back to the old days. Then men were lazy and women always ambitious. 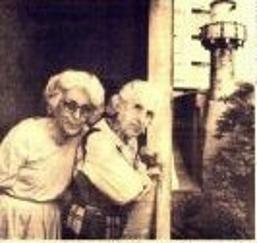 While she was living on Sıraselviller Street by Rue de Pera during the war years she hadn’t seen to many Turkish women. One day she learned that at the famous Tokatlayan Han Hotel in Bosphorus there was going to be a tea party for women in a ball room designated for women only. So she dresses up in a black “Çarşaf” calls a “fayton” and tells the coachman to drive the horse carriage to the Tokatlayan Hotel. It is usually little over an hours drive from Taksim down the hill to the shores of Bosphorus to the bay of Terapia. The story is similar to the one Jan Claire wrote to me about the taxi driver. Instead of taking the shortest way down the hill the coachman drives the carriage for hours on the side roads on top of the the hills and every time Mummy asks him why he is not going the right way she does not get an answer. Mummy is furious when she finally arrives at the Hotel where her hosts had sent some people to look for her. She calms down when they translate to her what the coachman says. It is the years of the World war I and all horses are confiscated by the army officers to be used for the cavalry. The poor man was trying to use roads where he was most unlikely to be seen . Mrs. Duran is telling the interviewer how beautiful the street of Sira Selviler (Rows of Cypresses) was when they first move here seventy years ago, how much greenery was around and how they could see the blue waters of Bosphorus from their balcony. Now she says, our view at the Ayazpasa flat is blocked by these tall apartment buildings and it so loud in the street. While she is talking, all of a sudden the “muezzin” starts singing the afternoon prayer from the nearby little mosque. “We don’t mind the imams call for the prayer, but what we mind is that he recorded his voice on a cassette and he is playing it five times a day without going up the minarette and really performing. Then all of a sudden as if she remembered something she shakes her head and says “It is tea time”. Lulu goes to the kitchen to bring the tea and Mummy goes out to the balcony with a hand full of bird feed. "These two pigeons are used to me over the years." she says as they start eating the bird feed by her feet. As my travel date to Istanbul gets closer I am nervously looking for some clues as to how to find Lulu’s grave. It is not an easy task; the Feriköy Protestant Cemetery is an ancient cemetery with thousands of graves from different nationalities of people. 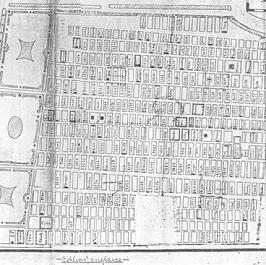 Researchıng from the internet I came up with five pages of blueprints of the outlay of the cemetery. The cemetery is divided among at least seven different sections : German, English, American, Armenian, Danish, Norwegian and Swedish. And of course, the largest section is the English section. I don’t even know how old the handmade blueprint is. After printing each page on my printer I started cutting the edges of the paper and tried to put the pieces together like a jigsaw puzzle. I am thinking to myself : I will definitely need some help unless I am ready to look for her grave without a direction among thousands of graves . Lulu’s grave is very close to the chapel on the right hand side looking up from the chapel door. I lived opposite her friend Ike and another American whose name I have forgotten but who later became a kind of aide-de-camp to the Sultan of Oman. Anyway, what surprised me about your article was that there was no mention either of Scrabble which became a passion with Lulu or Adair Mill with whom she was close friends with from about the fifties up until she died. She was friends with many of the leading intellectuals and artists of the day, both painters and actors. 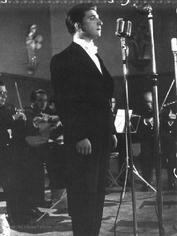 Some of them are still alive such as Gulriz Sururi, a well known star of the stage. Once again, I started feeling better now with all the information I was getting about the Lulu project. Two weeks from today, Inşallah* I will be landing at the Atatürk Airport in Istanbul. This morning I received an email from my friend Selçuk Erarslan, whom I had asked to accompany me during my search for Lulu’s grave in the Feriköy Cemetery. Selçuk is not only a good friend but also the main correspondent of Istanbullite.com in İstanbul, who has carried out several project of mine without me being in Istanbul and always supplied me with the information on the particular site, accompanied by many photographs. In his mail Selçuk says he already rehearsed our # 4 Trip, which includes the Feriköy Protestant Cemetery among few other spots we are going to visit. He even looked for Lulu’s grave and not only found it, but also attached to his email four pictures of the graveyard including gravestones of Lulu and Mummy. I was pleasantly surprised but also confused, whether I should expose these pictures before even I go and visit the site in person. After a long thought, I decided to at least put one of them online, the one from a distance, but take it off once I visited the site and took pictures of my own. I am sure Jan Claire will be happy but he will be still looking forward what to come next. I had picked a Thursday noon for the # 4 trip on my agenda. My brother Mustafa who lives with his family in Chicago had also joined me on this trip to Istanbul. He has his own friends to meet and his own agenda to follow, but when he is free he joins my tours and this morning he had an hour to spare before meeting his friends. We both met Selçuk at the Kabataş underground funicular station after crossing the Asian side of Istanbul to the European side by a ferry boat. The modern metro took us in a few minutes up the steep hill to Taksim Square where we were to start our tour from Sıraselviller Avenue, the street where Lulu had lived when Jan Claire had met her in the early 1960ies. Taksim square, the Piccadilly Square of Istanbul in the Pera district still resembled it’s old days this morning, with the Independence monument in the middle of the square, the Taksim Gezisi Park on the North side, the Opera house on the East and Rue de Pera or Istiklal caddesi right by the old Water distribution station where Taksim got it’s name from. Sıraselviler is the street running next to İstiklal caddesi and the one next to it where once the famed Park Hotel stood is going down the hill to Dolmabahçe, the famous palace where the last Ottoman Sultan’s lived and Atatürk had spent his last days. On the Northern side of the Taksim Park going to Harbiye or Tarlabaşı there are wooden barricades now and construction has started few days ago to change the Taksim square from it’s historic look and greenery in the Gezi Park to an ugly concrete square with highways going underneath. We walked towards Sıraselviller Avenue, the Orthodox Saint Triada Church still in the background and numerous hamburger and döner kebab places circling the corner of İstiklal Caddesi and Sıraselviller Caddesi, where once the famous Kristal Büfe stood. 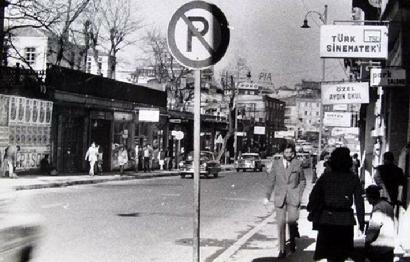 On the left right at the mouth of the street is a another construction site, the famous Maxim Gazino, where singers like Zeki Müren had entertained guests in the sixties and seventies. The front of the building will still resemble the art nouveau look of the old Maxim with the columns and frieze, but inside of the building going down the hill a whole block, will most likely be a five star hotel. I am thinking to myself :”No wonder Zeki Müuren was a frequent guest at Lulu’s apartment, Maxim was so close. We walk down the street passing the Belgian Embassy to our left and several boutiques and fast food places, all mixed together on both sides of the the street. We walk in front of a four story hotel at a corner called Park Hotel, obviously not the famous one which was demolished several years ago. Going towards Ayazpaşa we come across a little mosque, it’s minaret resembling the same minaret as in the picture of the Cumhuriyet Newspaper article about Mummy and Lulu. The three story building near the mosque was possibly the same apartment building in Ayazpaşa where Lulu had moved with her mother and they had lived the last years of their life. Mustafa has a great interest in seeing Çukurcuma, a little district down the hill, which became a tourist attraction after Orhan Pamuk wrote his novel “ The Museum of Innocence and opened his Memorabilia Museum with same name as his book. The narrow street with cobble stones is crowded with antique stores and foreign tourists with maps and brochures in their hands going up and down the hill . We take a little brake stopping at the “Asri Turşucu” pickle store to drink pickle juice and to eat pickled cabbage from the glass. Another district closeby is Cihangir, a renovated area where famous writer Orhan Kemal once lived , several famous television stars live today and the area itself is an inspiration to some Turkish sitcoms like, “Yalan Dünya”. Selçuk, his family, two of his grown children and his aunt live in a four story building here, inherited from his grandparents. We stop by to enjoy a cup of Turkish Coffee in their balcony, thanks to the hospitality of his wife Beyhan and enjoy the breathtaking view of Istanbul: extending from the Bosporus Bridges on the North to Scutari, the Leander’s Tower, Calcedon, Prince Islands, the Historic Peninsula with it’s famous churches and Topkapı Palace, all the way to the Golden horn on the West. Following our visit to Selçuk’s house we part with Mustafa and the two of us climb back the hill towards Taksim Square. On our way this time we pass through a street called: ” Dr. Mehmet Öz Street”, where apparently the famous physician and television celebrity once lived as a child. Selçuk takes my camera and shoots a picture of me : Mehmet C. ÖZmeral. There was nobody to be seen at the guard’s kiosk located behind the iron doors so we pushed the gate and walked inside the cemetery. Walking on the cobblestone path we first went through the German section of the cemetery, passing the gate saying “Armenia” and then we were in the English Section with the Chapel located in the middle of the cemetery. There seemed to be a major task of tree cutting and pruning going on inside the cemetery walls with branches and stems of cypress and pine trees laying all over the road and even on some graves. Most of the graves were surrounded with two feet high marble walls around them, typical of Turkish graves showing the borders of the land where the deceased is buried. But almost all of them had crosses or other Christian insignia either engraved on the marble grave stone or in the form of a small statue. While there were mostly English first names engraved on the headstones, most last names, especially those of women were in Turkish. That was probably because either they had married a Turkish men, or as most Laventens* did, had also adopted a Turkish name . The newer graves were well kept but the old ones looked like they were left to the ware and tare of the time with tall weeds and broken headstones laying all over them. Selçuk leading the way pointed towards a grave with marble walls around it and an engraved cross and two names on the headstone. “So true “ I said to myself . Just like this lady resting here Lulu and Mummy were loved, lived and never forgotten. Another bus ride from Feriköy to Akatlar, just like Selçuk had rehearsed few days before, took us to Tengün Sevinç’s neighbourhood in the Gazeteciler Sitesi. Selçuk had spoken to her on the telephone and and she had told him that she was going to be home after 2 :30 on Thursday and was going to expect us. She was a close friend of Lulu and had volunteered to show all of her pictures and books and documents to us. Had Lulu lived today she was going to be 98 years of age, so we were expecting somebody at least in her late eighties but Selçuk mentioned that she sounded so much younger on the telephone. We rang the doorbell to the one story little house and a lady with at least 30 years younger than Lulu’s age opened the door with a smile. “Buyrun, hoş geldiniz “, she said welcoming us inside her living room. We took our shoes off as it is custom in most Turkish homes. There was a round dining room table and two china cabinets as you entered the room and a step down led to the living room with a sofa and armchairs and a large window with the scenic view of outside. She asked us to feel comfortable wherever we liked. Opting for the dining room table to sit, I noticed several pictures of Lulu on the china cabinets. She had prepared hot tea and pastries for us which we enjoyed at the dining room table while she went inside and brought boxes of books, photo albums and documents, neatly laying them on the table one set at a time and started talking about Lulu. While she was talking about Lulu, she first laid down all of Faik Sabri Duran’s books including the Büyük Atlas and the Travel Book of Lulu to the United States. Then came Lulu’s albums from their days in England with her grand parents, Faik sabri Duran’s awards, diplomas, pictures... Selçuk asked her how she got to keep all this valuable memorabilia and if Lulu did not have other relatives. Tengün Hanım was now showing us pictures of Lulu in her younger years: a faded one with Lulu in a swimsuit on a beach chair and another one with the famous theater actress Gülriz Sururi both in swimsuits in the the resort area Kilyos. “She liked theater, painting, music and was very close to several actresses and artists of the time. 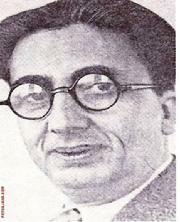 Zeki Müren was probably was the most famous of them all. Some people questioned her choices of friends but others liked their company. She had this unique talent of bringing people of different beliefs and tastes together and somehow making sure that they would get along fine. Adair Mill is one such gentleman who she was very close to. They played scrabble together with Lulu all the time and at first we did not know if he was her boy friend or just a close friend. Adair is an atheist and Lulu’s other close friend father Ian Sherwood is an Anglican priest and as you see in this picture they got along fine. 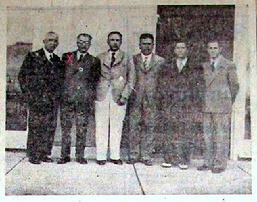 Adair came to Turkey in the late 1940s, and taught at Istanbul University, and later was the Director of Studies of ITBA (Istanbul Turco-British Association), which was a small language school affiliated to the British Council in Istanbul, but grew in leaps and bounds under his directorship to become a highly popular and successful teaching enterprise. He's 92 now and is not very mobile, that's why I hoped to take you over to see him. His mind is as active as ever and he still does translations for Türk Tarih Kurumu and for Doğan Kuban. His memory of the old days is amazing. You would have found him extremely interesting and entertaining. It was already five o’clock and we were getting late for our last leg of our tour that day. We thanked Tengün Hanım for her hospitality and all the information she had provided us. Before we left she allowed us to take a photograph of Lulu from her albums. I randomly picked up one picture of Lulu from the Album. We said goodbye to Tengün Hanım and leaving her house walked back to the bus stop. At the time, Lulu was living in the street off Sıraselviler, past the Marble Hotel(present name),and before the German Hospital. The street or narrow one car alleyway was called Aslanyatağı Sokak. A very short, narrow, sharp left, sharp right, one lane down past a small hotel, which was right opposite where Lulu lived. 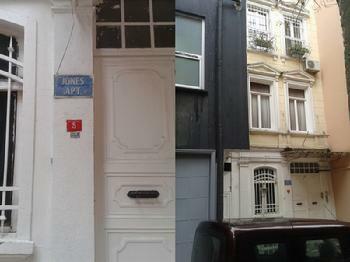 When you turned left into Aslanyatağı and left again straight ahead was a narrow, tall, old building called 'Jones Apt.' Mummy lived on one of the floors there.I remember thinking it was a bizarre joke. I couldn't believe that it was possible to have a 'Jones Apt.' in Turkey, especially in a street named Aslanyatağı. It all added to the experience of knowing an adult (Lulu) who was unlike any other adult I knew.She was fun and wise whereas others were just boring.Lulu's place was the ground floor flat, round the corner, with a large porch and small garden overlooking the small hotel. FROM SELÇUK ERARSLAN'S MAIL wrıting that he took the picture of Lulu's Jones Apartment ın the old Aslanyatağı Sokak, now called Dr. Mehmet Oz Street. İlişikte ayrıca Tengün Hanım'ın yazısında bahsettiği Jones Apartmanının resimlerini de gönderiyorum.Senin Dr.Mehmet Öz sokağı tabelasının önünde resmini çekmiştim.Apartman o sokağın üzerinde imiş.O gün evin bu sokakta olduğunu bilemediğimiz için resmini çekmedik.Şimdi bu eksiği de tamamlamış olduk. Cem, I cannot thank you enough for such a sweeping tribute to, and for such wonderful information about Lulu. The pictures are simply awesome, and so many good memories came back through the pictures you were shown. I will look at them often. Also wonderful you found Tengun. The whole thing has traveled me back to "my era" in Turkiye and so many memories came washing ashore! Cem Ozmeral,(left) so closely associated with our friends at Golden Corral Restaurants, has become a valuable friend of our owner/publisher here at MerhabaTurkey.com, Jan Claire. Over the years, Cem's organization has supported our military veterans with free meals on Veterans day, and, being born a Turk who emigrated to the U.S., Cem ("Jim") and his friend Jan have become best friends. In the course of daily conversation, Jan has related his continuing interest in Turkey, and over time he spoke with Cem about one person whom Jan and his friends were close to in Istanbul, a four hour ferry boat trip from their base at Karamursel. As Jan related more and more tales of Lulu's hospitality, her life as an english teacher in Istanbul's major universities, her parties and the many tours of Istanbul she gave to her U.S. military friends. Lutfiye "Lulu" lived on Siraselviler Caddesi(Cypress Street) in a small home with a large garden. Her friends joined her in wonderful dinners at popular Istanbul restaurants, and good times traveling around the Bosphorus area up to Black Sea's resorts. Cem became fascinated by Jan's frequent question: "whatever happened to Lulu (at right, in 1959) after I left Istanbul?" So Cem did what Jan never could do: he recently flew to Istanbul, nosed around, found that Lulu had died back in 2003 at age 89, is buried in a cemetery (above) in the Pera area of Istanbul, and he took pictures of the gravesite, found old pictures of Lulu taken before then, and even information about her mother "Mumzy" (Corrinne) who lived to 105 years of age! The full story of his adventure is found on his popular website HERE. Cem discovered information, as well, about Lulu's famous father, Faik Sabri Duran, a noted geographer who's Buyuk Atlas has been the predominant geography text in high schools and colleges for a long time. Duran did much in the mapping of the Aegean areas of Turkey and Greece as well. As Jan told us upon receiving the many photos Cem has now posted on his web pages (link above), "Cem is my Turkish God. He has done the biggest favor one would ever receive, and I will never be able to repay him because knowing the rest of the story which took place after I left Turkey is beyond valuable to me." Thank you, Cem, from all of us here at "web central." took. I apologize for not being able to write and thank you before. First I'd like to say how much I enjoyed meeting you and your friend, Selçuk bey. very informative and entertaining. Just the sort of reading I am also interested in. now, so true and poignant. with my parents. But still, words like 'terkos' for tap water are so familiar to me! is huge, I know, but she never made me feel that I was anything else but a friend. Türk Tarih Kurumu and for Doğan Kuban. His memory of the old days is amazing. You would have found him extremely interesting and entertaining. Prof. of Archeology. There are many pictures of them all together in one of the albums. 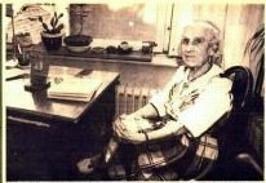 Halide Edip Adıvar, who also was Mina Urgan's teacher. an extremely entertaining teacher and made grammar learning fun. hotel, which was right opposite where Lulu lived. old building called 'Jones Apt.' Mummy lived on one of the floors there. to the experience of knowing an adult (Lulu) who was unlike any other adult I knew. She was fun and wise whereas others were just boring. garden overlooking the small hotel. While I was still a university student, Lulu persuaded me to substitute for an Eng. Lang. other places. She always advised me 'Never keep all your eggs in one basket'!! But she didn't teach at Robert College, as you mentioned. down that street in İzim Apt., with their windows facing a mosque ( not the Cihangir Mosque). of parties with lots of interesting people. She wouldn't have moved if she hadn't had to. wild parties, but lots of tea parties and interesting lunches. She loved people to visit her. and the person I substituted for was a teacher of English grammar at the ITBA. He wasn't a professor of Eng. Lit. with all her books which I have downstairs. I forgot about it when you were here. such a deep impression on him. My best wishes to you and your family in the new year. Thank you very much for your nice e-mail and kind words for the "'In Search of Lulu" story and my book. Thank you for all the additional information and corrections in your mail which will make the story more complete. I made all of the corrections and added the information about Adair Mill and Mina Urgan to the English text. I also copied your e mail to the Readers' Reactions section. The only thing I did not change in the story is your very nice and detailed descriptions of the streets in the Siraselviller and surrounding districts. I thought Jan as well as other readers can enjoy reading this part directly from your mail. Soon, I will also make the corrections in the Turkish text too. Selcuk and I really enjoyed our visit to your house and were grateful for all the information you gave us about Lulu and for your hospitality. The story I wrote is not perfect nor complete, but at least it will tell people who never knew her, what a fine and fun lady she was and this way she will be never forgotten. Hopefully on my next visit we can all meet together including Mr. Mill. Size, ailenize ve sevdiklerinize sağlık ve mutlulk dileklerimle. I read your account of the results of your search for lulu with very great interest but I very much regret that we weren`t able to meet and talk over some points.I don`t know whether there is any point in doing so at this late stage but there are one or two points I should like to make. I have no idea how this "mumzy" nickname arose. I am certainly not aware of it. As for Lulu`s friendship with Zeki Müren and Gülriz Sururi this is the first I have heard of it but unawareness is no proof of anything. Nor did I ever hear of Lulu having translated any musicals. You describe her as "motherly". I should think that is the least likely epithet to be applied to her. I never knew of her taking part in any walking, hiking or running activities, but again that is purely negative and no positive proof. Nor was I aware that she knew more than a smattering of German or Italian. It is a pity that you didn`t get "Mummy`s" account of how she became a Turkish citizen as that was quite amusing. As for the photograph of Lulu and her mother on their balcony with the minaret in the background, that was taken in their flat in Ayazpaşa. The flat in Sıraselviler had no balcony.I t was a ground floor flat opening on to a garden with the hotel you mention opposite.The name was neither "Parc" nor "Park"but I`m afraid I can`t remember what it was. By the way,it might be of note that Lulu and her mother lived together in the Ayaspaşa flat until her mother` s death . The relations between were sometimes rather strained. I have no knowledge of any catholic priest but both mummy and Lulu were visited by an Anglican parson whose name a can`t remember and later by Ian of the Crimean chapel. I was at Lulu`s funeral,naturally, but I never returned to the cemetery to visit her grave, so it was a real shock to me to see from your photograph that the name given on the tombstone was "Lulu" instead of her own name. Thank you very much for your input and corrections to the Lulu story. If I only knew your e mail address, I would have certainly contacted you. Mrs. Sevinc was kind enough and offered to bring us to your house after our visit. But I only had two weeks in Istanbul and I had asked her if we could all meet in a cafe or caybahcesi, but that did not materialize. It is never late,I will put the whole mail to the end of the story and make the corrections about the Ayazpasa apartment and Father Ian Sherwood being an Anglican. As far as subjective descriptions like " motherly'' made by Jan Claire, I will leave in tact. Same with the languages she spoke , musicals, trips and hiking etc. That was how Jan described it and how he remembered after fifty years, I will leave those alone.Mrs Sevinc also does not recall " mummzy ", so I will take that out. Again, thank you and I am so sorry I did not get a chance to meet you. Once I make the corrections, I will send you the link. I chanced upon your website, Istanbullite, via google search, and ended up reading with interest your narrative, “In Search of Lulu”. In fact, the reason I consulted google search to begin with was because I had recounted a story about Rena (Mami) and Lutfiye (Lulu) Duran to a friend. I was actually hoping to find a Cumhuriyet newspaper article that I had recalled from when I was in junior high that was mentioning their story. 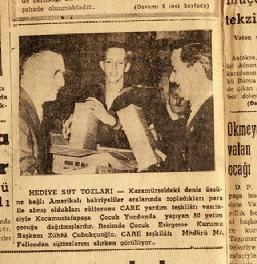 Instead of this article in Cumhuriyet’s archives, I found your story about them. 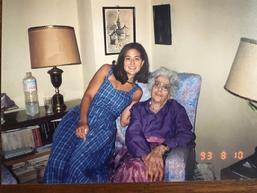 I was one of the few fortunate people to have had the opportunity to know and spend a few significant years with both Mami and Lulu Duran at their older ages. 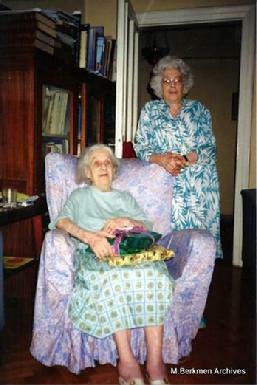 Mami and Lulu, were long-time residents of Izim apartment which belonged to my grandmother and her two sisters’, where my family and I also resided. 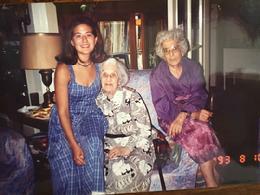 Throughout the years in Izim apartment, a strong bond had formed between my family and them. More significantly for me, they had contributed much to my milestones and growth. I am very happy to be contributing in return to a narrative that has tried to capture their story. Your narrative recounts Lulu as a “motherly” figure. However, I am pretty certain, Lulu, would not have preferred to be remembered as having been “motherly”. She was much rather an exceptional ‘Mentor”. Probably, Victorian influenced in formation, she had strong sense of social and moral conduct, she gave importance to manners, and she was a true Samaritan. At the same time, one could also see, she had synthesized the manners she saw of the upper/educated classes in Turkey and had welcomed the blending of both her Turkish and her English heritage and upbringing and as a result she was not only bi-cultural but my first role model for a “world citizen”. 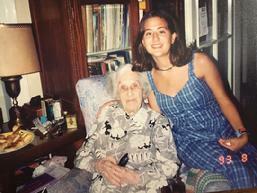 When Lulu was tutoring me in English, she seemed to me more like a visionary friend even at her later years (and between us there was approximately 60 years of age). However, when Mami and Lulu met me for the first time, I was probably not older than 3. Somehow they had accepted to babysit me from time to time ( I think I may have been the only child they may have accepted to babysit, for they were otherwise not very tolerant with children – and understandably so as they were quite old for that too). However, I remember the numerous pretend “hair washing” I used to impose on poor Mami, and she used to put up with it. Later on, when I was 4-5, Lulu took me on as her first and probably only “young learner”. My mom had kindly asked Lulu if she would start supporting me with my “fading English”, and though she may have refused initially, eventually, I had a book full of collages of “cats” and “dogs” and “butterflies” labelled with their respective English names. For me, their house was a very special “story land” especially during the Christmas/New Year period. I remember the colorful Christmas Tree full of decorations and brilliant lights. It appeared to fill up the whole winter with joy and warmth for it seemed so luminous and colossal (probably because I was so small next to it). They would welcome us and they were happy we had made the time to wish them good wishes for their special holiday. Furthermore, at that age, I also loved visiting them for their cats, which were forbidden at our house, so these few precious moments was also my time with the pets. Mami and Lulu were very rational but at the same time wonderfully kind ladies. They were also true samaritans. When they themselves were too old, they were still thinking of yet another old neighbour in the apartment to send a warm dish (Samaritan – Turkish style). When I was little, I remember attending at least one of the charities that they were also voluntarily helping to organize. My mom had bought me a few English children’s books from one of them. I still adore these books. Naturally, it is important to mention here Lulu’s late father Professor Faik Sabri Duran’s “Buyuk Atlas” which accompanied not only me to my geography lessons at school, but probably many generations of Turkish children. According to my mom’s narrative of Mami, Rena Duran (Mami) and Faik Sabri Bey met in Paris. They were both students at the time. As, Faik Sabri Bey spoke fluent French, Mami who was the daughter of a well to do family from Brighton, always thought that he was French. When their relationship reached a more serious point and Faik Sabri Bey asked for her hand in marriage though, she found out that Faik Sabri Bey was a Turk and that their lives would be continuing in the Ottoman capital of Istanbul. Despite their respective family’s opposition, they decided to get married. Mami Duran had told my mom that they had arrived in Istanbul in 1911 and that she could not praise enough the graceful tastes of the people around her. In fact, these were the high society snapshots of tasteful ladies and gentlemen, while the empire was unfortunately decaying and fighting wars in multiple battlegrounds. Since the day she moved to Istanbul, Rena Duran tried fervently to be part of the culture. She even tried to learn Turkish: One day when she was alone at home, the phone rang, when she answered the phone; the caller had asked for her husband. Eager to practice, she probably tried to use a new word she had learned, only to mix up the place of the letters “c” and “z”. She said “I am Faik Sabri Bey’s “cezvesiyim” instead of “zevcesiyim – which meant “his coffee pot” instead of his spouse”. There naturally was a mocking laughter on the other end. “The mocking laughter” was also naturally the end of the “Turkish language” journey she had so dedicatedly started. She came from the Victorian era nevertheless, and “mockery” was not very acceptable! Hence, she decided she would give up speaking this confusing language (Please note here that this story has remained special in our hearts and we still recount this story occasionally with love and delight; and it is this very story that made me look into “google search” for the Cumhuriyet article). As a matter of fact, both Mami and Lulu, despite their respective ages, were very progressive minded, social, enjoyed being connected, and followed with zeal all the current events; they were young at heart and took pride in holding strong to life. Mami always had the Time and the Newsweek Magazines right next to her couch. During our visits, their favorite topics were discussing what was new in Turkey and in the World. Both of them also gave a lot of importance and emphasis to their appearances, despite old age. They used to take pride in taking time to always dress within the same color code: If the day’s choice was light pink, there was an effort made to match it from the broche to the hat or the shoes, with ofcourse slight matching variation in between. One could see this was the respect they held for themselves. According to my mom’s narrative, Lulu may have also been my maternal grandfather’s English teacher from Haydar Pasa Highschool for a short period of time. Your account of Lulu also highlights that she was born in 1914. Lulu’s father’s family, unfortunately had not welcomed Rena Duran as a bride and Lulu as a grandchild, therefore, Lulu’s childhood memories are mostly from England. Mami used to tell how Lulu’s maternal grandmother helped bring Lulu up with an English formation and how she did ballet and piano lessons. Slightly before World War II, they had relocated to England, and we know that at age 27 or 28, Lulu was now serving as a volunteer firefighter during the War. She got married for the first and last time during these years. Though, her husband returned after the war, this time Lulu suffered from a medical condition (asthma) that required her to relocate to Turkey (England had major air pollution at the time and Turkey had not). 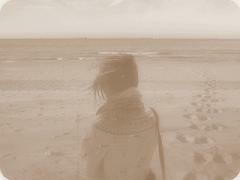 This heart-break became an undisclosed chapter in her life; she would never speak of it. Ironically, during the years I was studying with her, Istanbul had had its fair share of big city air pollution. I could see how this was a concern for Lulu. However, at this point, Lulu had already formed a bond with Istanbul that was past the point of no return. During junior and then senior high, I spent more and more time with her studying English. Our lessons were not limited to textbooks. Lulu was very methodical and her teaching style was an amazing synthesis of classical and modern teaching. She gave a lot emphasis to grammar foundations. Therefore, I used to come back home with multiple grammar exercise books for homework. However, our lessons, right after homework revision, and a few more grammar exercises, was filled with discussion of current affairs as well as reading and discussing. Our lessons were a horizon unfolding; beyond English language, she was scaffolding culture, manners, perseverance, general interest for classical novels and current events and much more. Lulu has been a major influence in my understanding of the concept of “English punctuality”. My family also gave a lot of importance to punctuality, however, during the time I worked with her, punctuality formalized itself into a concept that comprised of responsibility and respect (to others and myself). Lulu’s house was full of books, especially her study had a library, just the way I was used to seeing this at home. I borrowed my first Agatha Christie books from her (Sometimes I wondered, if she had even met Agatha Christie herself – since Ms. Christie is known to have spent some time in Pera). The Agatha Christie novels that I borrowed from her, helped my progression in English to the next level. Later on, some of the other authors we read included Edgar Allen Poe, Somerset Maugham and even Charles Dickens. Much later, we would meet occasionally outside of lesson times and have lunch at one of the two Chinese restaurants in Istanbul. We also went to watch a few of the Oscar movie nominees during my adolescence – “out of Africa” and “The last Emperor”. From three years to adolescence, Lulu, besides being my English tutor, had taken the role of an unofficial mentor in my life. She was there guiding and scaffolding probably some of the most important values during a child’s growth into a grounded adulthood. My last year in high school, I have more recollection of the mad race we went through to get a solid placement in University. I got into Bogazici University’s English Language and Literature program, with a placement ranking of 16thfor Turkey. This made both me and Lulu very proud. But, I decided to continue my education in the U.S.A. During College, I used to visit her when time allowed when I went home in the summers. I also remember writing letters to Lulu and Mami and getting their news via my parents. Mami passed away during my College years. Lulu passed away when I had already returned to Turkey and had started working. I attended her funeral. As far as I remember, all her loved ones who could attend that day were there for her. I remember most distinctly from that day, that the orator had emphasized that Lulu had tried all her life to synthesize, balance and unite two separate cultures; and that she would be remembered with her dedication to creating bridges not only between cultures but also between generations. They have been exemplary with their dedication to life and youth, current affairs, their pride and manners but most of all their dedication in life to lead a “meaningful” life – a true Samaritan. Time has flown too fast for me to grasp, but the moments we shared with them are forever a treasure in our hearts and minds.